The station is called Prien am Chiemsee and is very close to the tourist information center as well as the actual Chiemsee. It's only few minutes away by foot. The nearest highway is the A8. At the exit 105 Frasdorf, drive in the direction of Arschau. From here you just follow the signs. The Chiemsee, also known as the "Bavarian Sea", is the third largest lake in Germany. The area around the Chiemsee is one of the most popular recreation areas in Bavaria. Aside from swimming and sunbathing at various spots around the lake, saliling on the lake is very popular at Chiemsee. You can also cruise around the lake in rowboats and pedal boats. Around the lake is a riverside path that runs directly along the water and is used by cyclists and walkers. Here you can take in amazing views of the lake. You have the opportunity to do many different kinds of activities on and around the lake, like canoeing and kayaking tours, sail boarding, and for relaxation after all of the physical exercise, you can sit and enjoy one of the many beach bars around the lake. The castle brewery Maxlrain offers gorgeous scenery and a highly-rated, traditional brewery. Visitors can experience authentic Bavarian tradition here. They offer 15 various brews, which are all manually produced using only the best basic ingredients. Summer toboggan runs in Oberaudorf provide pure exhilarating fun. It has a 360° super-circle with a length of 1100m, which is the only one of it's kind in the world. This is fun for the whole family. There are two famous islands on Chiemsee which are must-sees. One is the Fraueninsel with a nunnery, and the other is the Herreninsel with two beautiful castles. Both islands are absolutely worth a visit. 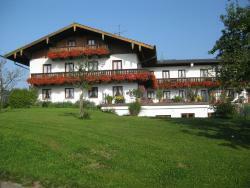 Set on an organic farm, these family-run apartments enjoy a peaceful location in the Chiemgau region. Spacious accommodation with free WiFi and shaded terraces is offered here. This farm house offers 4 and 5-star apartments set in the Eggstätt-Hemhoff Lake District, Germany’s oldest nature sanctuary. Guests can enjoy the animal riding and petting zoo as well as free Wi-Fi.